I had not heard Jared Konersman, aka Jay Bangles, perform until 24 hours before writing this article. In our conversations leading up to the show I found it hard to believe that this softspoken crooner could command an entire rowdy crowd at Irish Kevin’s five nights a week. He was just sooo nice. The infamous rambunctious bar in the 200 block of Duval Street is not known for its “nice” atmosphere. Instead, it is always in party mode ranging from fun to debauchery; a place where drunk patrons and inappropriate lyrics can simultaneously spill out onto the street into the early hours of the morning. Yet when Konersman took to the stage the night before our interview, he immediately captured the room with perfectly timed jokes propelled by an honest and enthusiastic personality. “Hey, welcome!” he would shout at every newcomer to the bar, and whenever someone ordered a round of shots, Konersman would suddenly stop whatever song he was playing, put down his guitar and blast “Shots” by Lil John from his pre-programmed iPod. And all the while he was smiling from ear to ear even when he was singing. For the audience, there is something charming about Jay Bangles the performer. It wasn’t long before people were swaying back and forth to his mix of everything from modern country to ’90s alternative and sincerely laughing along with his cheeky humor. “So, should I call you Jared or Jay?” I ask him. On his 13th birthday Konersman asked his Dad for a drum set and got a guitar. Nevertheless, he eagerly enrolled in two years’ worth of lessons and practiced so much that by the time he was 15 he had mastered entire albums from front to back. Naturally, after building such an impressive repertoire, the next step would be to join a band, an a cappella quartet, the choir, and become the president of the art club. Then, after all of that, it would only make sense to receive a phone call from a place hundreds of miles away asking Konersman if he would like to partake in a five-day audition to be the guitarist for a band somewhere in the middle of paradise. So he went to Key West, driving straight down after flying into Miami on a little bit of sleep and a lot of rattled nerves. He ended up being hired as the bassist, but not before bombing on the first day. He would go on to play with the Durtbags at Durty Harry’s in Ricks Entertainment Complex from 2010 to 2013 before branching out on his own. When he eventually quit the band, it was because he was simply looking for something different. The heavy demand on his vocal cords left him with a constant scratch in his throat after too many hours and too many days a week. During one spring break the band played back to back for 42 days in a row. As much as he loved the gig, he was pushing himself to the brink of exhaustion. At the end he would give Rick’s a respectable six-week notice before teaming up with drummer Jim Simonian to create the Jay and Jim Show at Irish Kevin’s across the street. He now plays a regular 3-4-hour schedule on Wednesday, Thursday, Friday, Sunday and Monday at 11 p.m. He tells me that he has no immediate plans to leave Key West or Irish Kevin’s. He truly likes what he does and it shows when he plays. Although he effortlessly maintains a carefree attitude, for him music is a very serious thing. It has defined his life. It has brought him from one place to the next and helps him to pay the bills and then some. 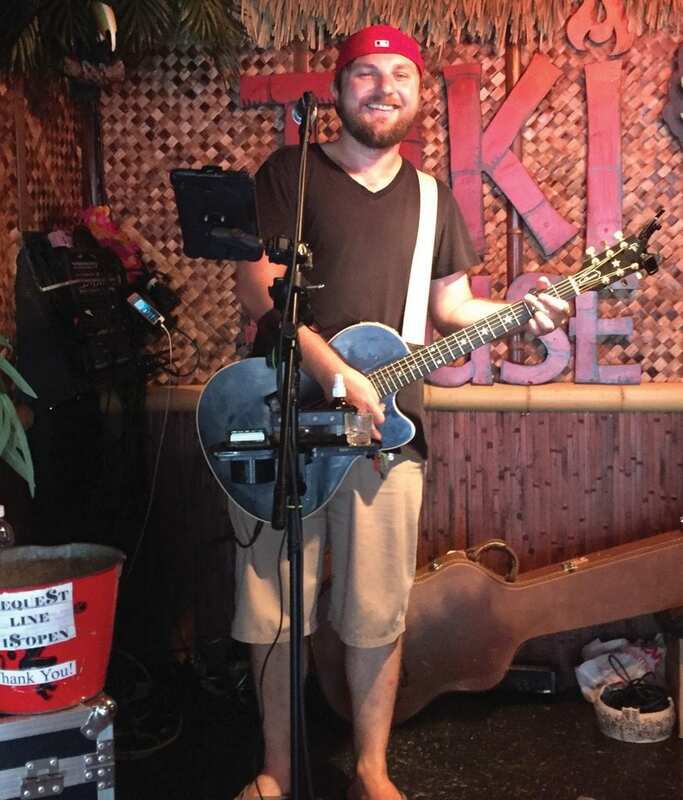 He recently traveled through Japan on a motorcycle and is one of the owners at Tiki House on 430 Greene Street where he also performs every Tuesday and Friday from 3:30 until 6:30 p.m. He describes the bar as a breath of fresh air. Taking a stage name is all part of stepping into character, but there is no distinct difference between Jared Konersman the person and Jay Bangles the musician. They are both, without a doubt, worth getting to know. If you are a local and you haven’t had a chance to be charmed by his jokes and enthusiasm, take it from me, it’s about time you do. If you are a tourist, chances are you’ve probably already been there, but if not then make sure to add a night at Irish Kevin’s to your itinerary. Then let music do its thing.